SANTA ANA, CA (April 1, 2015) – As spring rolls in, so does Yokohama Tire Corporation’s (YTC) second year of its national mail-in rebate promotion: Spring Getaway. 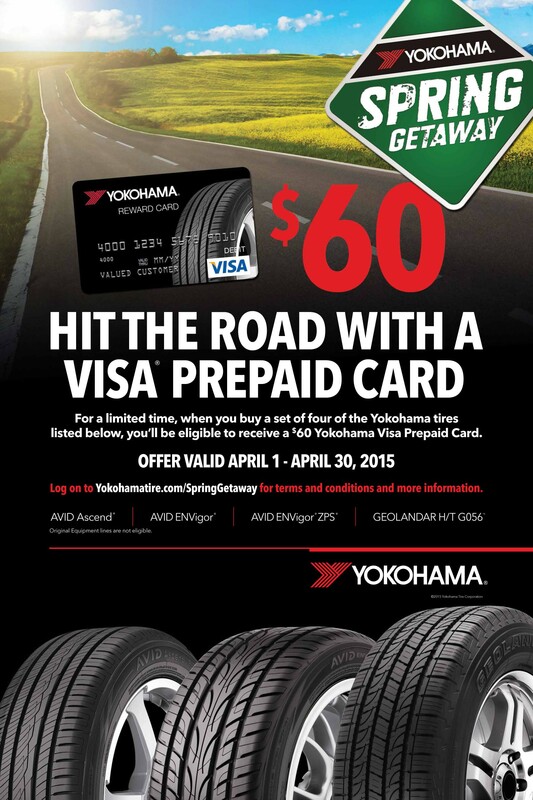 Through April 30, consumers will receive a $60 Visa® prepaid card after purchasing a set of four select Yokohama treads. The rebate is available at participating Yokohama dealers nationwide and at select online retailers. Multiple treads are eligible, including the AVID Ascend®, GEOLANDAR® H/T G056™ and the GEOLANDAR® G055™. Details of the promotion can be found at www.yokohamatire.com/SpringGetaway.